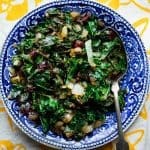 I’ll admit that simple sauteed kale with balsamic vinegar and dried cranberries is not the sexiest recipe to highlight in the first few days of the the new year, but with so many of us (myself included) cutting back on refined sugars, grains and dairy, I think it is appropriately useful to share it with you today. It’s a recipe I have been making for the better part of a decade, and it is always a great addition to our healthy plate. It happens to be vegan, paleo and gluten-free, but that’s not all it has going for it. It also happens to be sweet and tart and a delicious way to enjoy fresh kale! I originally shared this recipe on October 29th, 2013. I have updated the text, images, added a video (see below) today. Are you craving fresh food right now? I am pretty certain you’re going to say yes, and friend, me too! Like times 1,000,000! I’ve been digging into the veggies like there is no tomorrow. Don’t get me wrong, I had a great December and holiday season. But after a lot of Eggnog White Russians (OMG yum!) and Pecan Snowball Cookies (who can say no to a snowball) I don’t feel that great. In other words, I am ready to get a little bit of green on my plate right now. I have more news to share on all that and what I am doing about it, so if you follow me on instagram or you’re on my email list I’ll be sharing more about it over there. 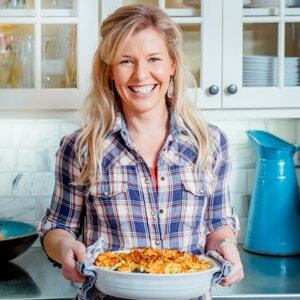 The first time I made this recipe seven years ago, I’d been in a similar boat. I’d been traveling with my family and after too much processed foods, I craved something whole and fresh. So I went out to our row of kale in the garden and took no mercy. After I removed the ribs from the kale, I chopped it up. Then I sauteed it with some onions from the CSA, some apple juice-sweetened organic dried cranberries from the cabinet and a drizzle of really good balsamic. I have been making it ever since. I almost always have the ingredients on hand and it provides a nutritious and delicious counterpart to so many dinner combinations. I love the way the sweet and sour flavors work with the slightly bitter kale. It is such a simple recipe, after trying it once, you’ll be able to do it over and over again without even measuring!! I have noticed that sometimes it is the most simple recipes (like this green beans with walnuts and balsamic or this lemon garlic broccoli) that resonate the most with busy families. So I really hope you enjoy it too. 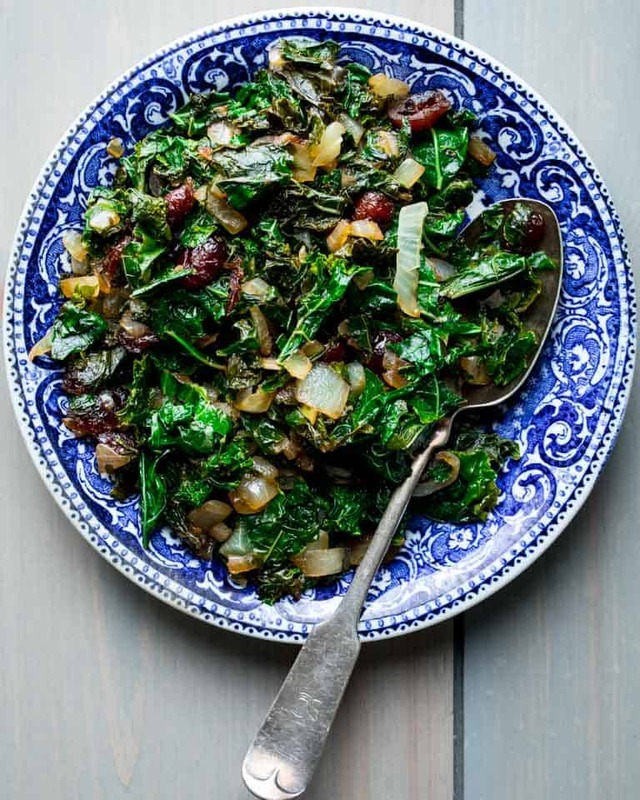 Shopping Notes: You can use green, purple or lacinato (dinosaur) kale to make this recipe. Also, dried cranberries are most commonly sweetened with sugar. If you are following a paleo diet, look for cranberries sweetened with fruit juice. I find them near the bulk department at our local health food store. Kale cooks down a lot when you cook it, so you’ll need to start with a full head of kale. Since the size of bunches of kale varies, if your market or CSA has smaller bunches, grab two. Remove the ribs, chop the kale and wash it. 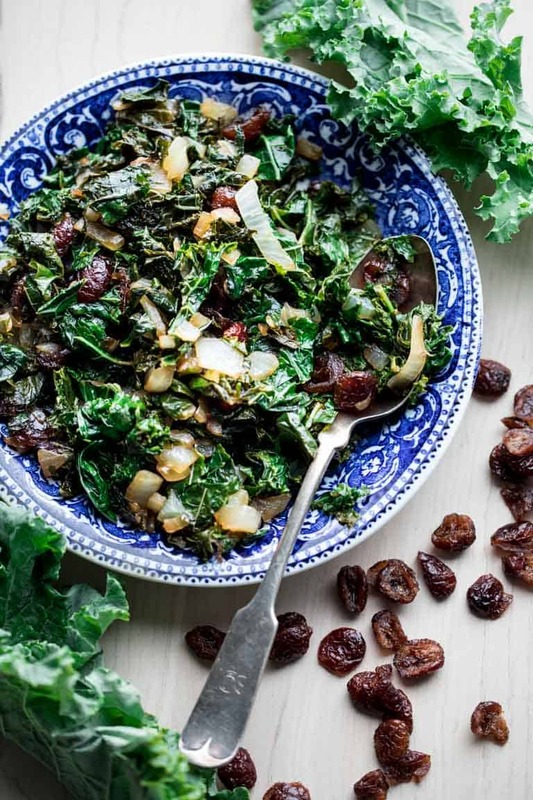 You’ll want 8 cups of chopped raw kale to make this recipe. If you use lacinato, you’ll want to cut the leaves more finely. Next you’ll need a diced onion. If you missed my post earlier this week, please check out the proper way to dice an onion. It is part of my new series of cooking basics called “In The Kitchen.” I use whatever kind of onion I have on hand, but I think sweet onion is really nice to naturally boost the sweet flavor of this kale recipe. After that add on the kale, salt, cranberries and water. Quickly cover the skillet to capture the steam from the evaporating water, and let the kale wilt. I usually stir it once or twice, to help it wilt down evenly. To keep an ever so slightly crunchy texture and brighter color, err on the side of not over-cooking the kale. But if you prefer soft and tender greens, feel free to continue cooking it to your preference. If you do so, you’ll likely need a splash or two of water as the skillet goes dry. Finish the dish off with some really good quality balsamic vinegar. It will really brighten up the flavors. It balances the bitter of the kale and the sourness balances the salt. Do you feel the need to eat cleaner now that the holidays are over? Do you crave fresh food after a lot of celebrations and big meals? Thanks so much for reading. If you make this recipe, please come back and leave a star rating and review. I would love to hear what you think! 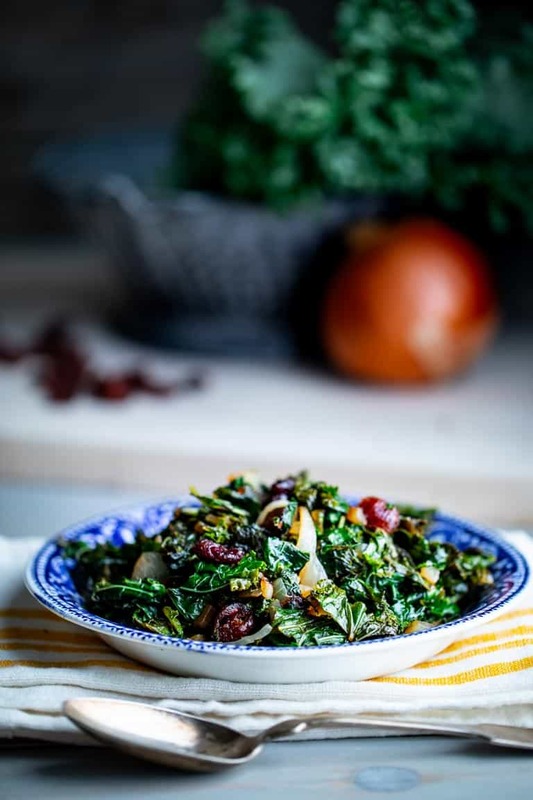 Easy healthy kale saute with dried cranberries and balsamic vinegar. Gluten free, vegan, clean eating and paleo. Heat oil in a large skillet over medium heat. Add onion and sauté until starting to soften and are browned, 3 to 5 minutes. Add kale, cranberries, water and salt, cover and cook, removing lid to stir often until the kale is wilted and tender, 3 to 6 minutes longer. Drizzle with balsamic vinegar. Here is one of the original images I shared with this post. Haha, Katie, I hear you. Some weekends are just…I feel like all I want to do is drink green juice for a week after. Especially when you are on the road and parties… This looks great! Pinned! Thanks Olena. We did have a good time, but it is nice to be back in my kitchen. Katie!! The photos, the recipe–I just am so in love with everything about this! Sheesh, Thanks Ari! I’m blushing. Yum! I just had a salad very similar to this at a local restaurant, and it was my favorite part of the meal! How do you get your kale so nicely shredded? Just careful knife skills? Thanks Lori. I just chopped it with the kife my sister gave me for my birthday. It is crazy sharp. Hmmm, I like this post very much. I really like the way you have presented everything in a sequential and structural manner. Very good! Thanks for the nice posting it is very informative post we are also working in the same field and welcome you to visit our website. Looks delicious! How many servings does it make? I’m looking it up on the Weight Watcher website, and it’s necessary to know the single serving size. It makes 4 servings. Enjoy Harriet! 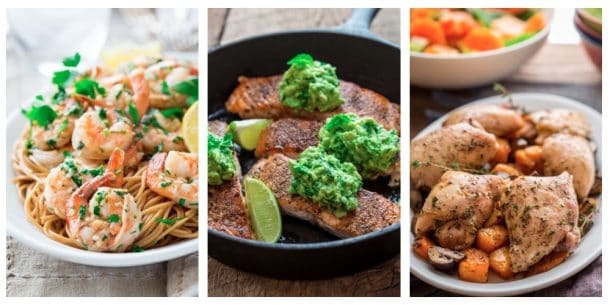 This is so easy, healthy and yummy recipe, I made it for my wife and she and I loved it. Thanks. I am thrilled to hear you made this and I really appreciate that you came back to let me know that you enjoyed it. That means a lot. Have a great day! Hello… can you make and leave for leftovers or will it not be good? Yes the leftovers are good. The balsamic vinegar discolors the kale but it will still taste good. Kale and cranberries go so well together and his looks delicious. That’s great you’ve tried the combination of kale and cranberries before Dannii. I hope your new year is off to a good start. Thanks so much for coming by today. This is the perfect recipe to start the New Year ‘fresh’! Balsamic dressing and cranberries are one of my most favorite combos so I know this salad will be a new love for me! Hi Jillian. Thanks so much for commenting and rating. 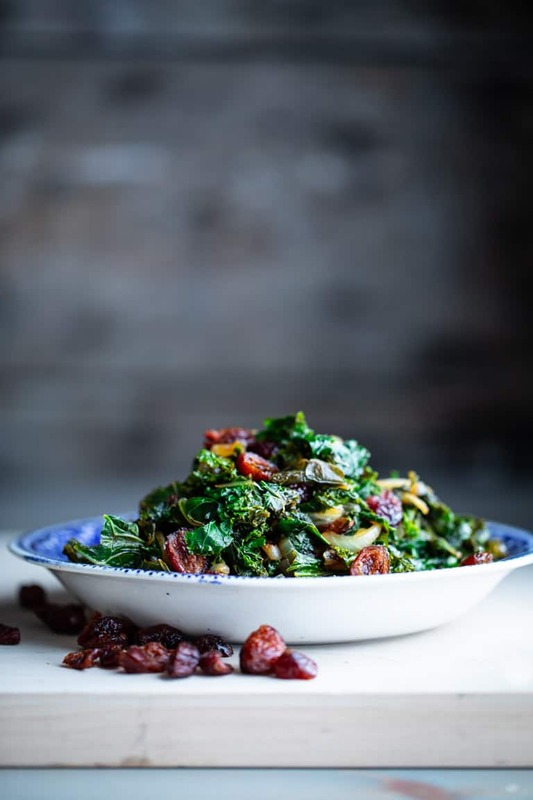 There is a tavern near here that has a cooked kale “salad.” So while I think of this as more of a sautée, you may be in good company calling it a salad. This salad is so pretty, I just want to eat the whole thing! 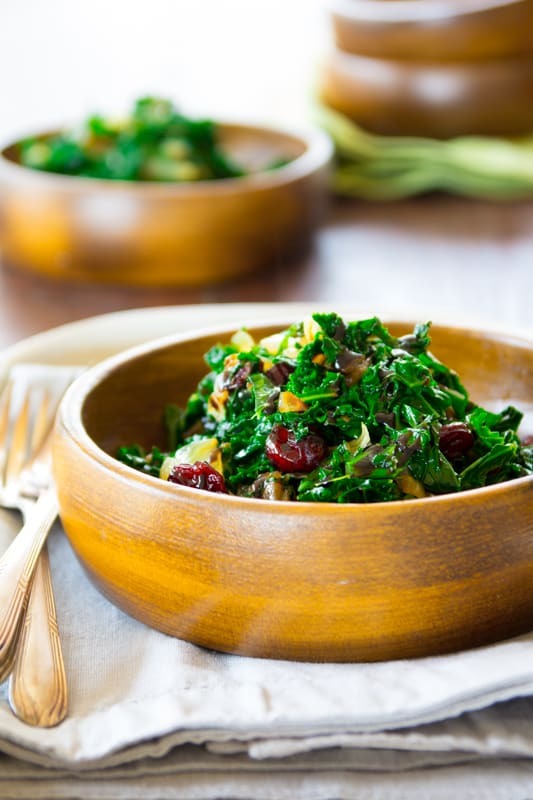 😉 Love the flavors of the kale and cranberries in this beautiful salad! A perfect way to start off the new year on the right track! Hi Sherri, Happy new year to you! Thanks for coming by. This kale looks beautiful and sounds incredible! I love the pop of color from the cranberries. Definitely perfect for the new year. I totally agree about the cranberries because they really add so much. Color included!